…just sold for a whopping figure..by Rick Schwartz, who bought the domain for $750,000 in 2005. Rick’s asking price for the domain was $10million at some point. Did it sell for more or less,.. we will not know since the actual sales price was kept confidential. The new owner of property.com is Brad Geisen of Foreclosure.com who promises a killer website on property.com ,sometimes in 2009.
another news,. 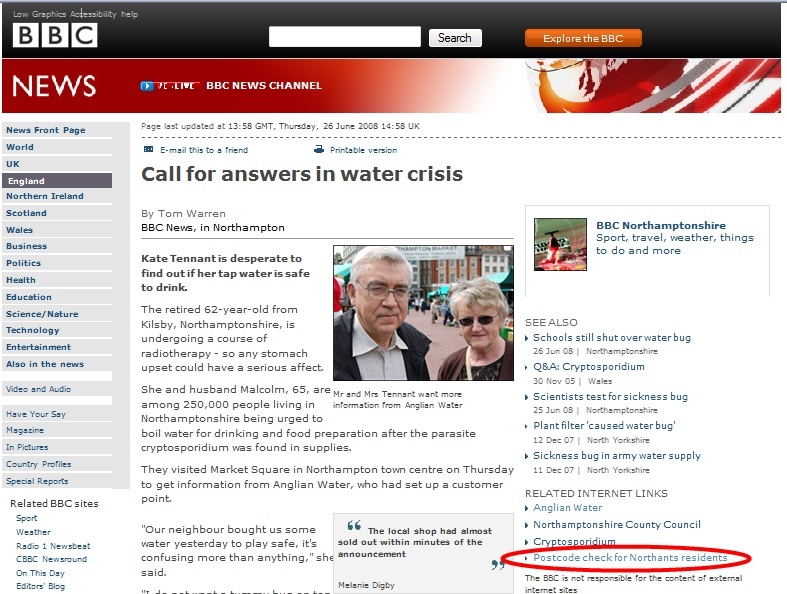 maybe you know digg.com , well google is showing a lot of interest in it.. watch this space..
Over the last 2 weeks, there has been a water crisis in the Northamptonshire area in the UK. Residents, businesses have been warned to boil their water before consumption. This cryptosporidium parasite contamination in the water supply even made the national news, and in some cases caused panic when the supermarkets started running out of bottled water. The folks at Anglian Water, the company responsible for water distribution for the area, must have been under a lot of stress. They still are since the region has not been given the all clear yet! Their call centers must have been flooded with calls from anxious customers. Geodesys, a division of Anglian Water, got the bright idea of setting up a cool tool to inform people if their tap water was safe by just inputing their postcodes! Great tool! I was able to check if I was safe. My first thought was that I would tell all my friends about it. Easy thing to do …. by Email, but how on earth am I going to remember that big long url, and repeat it to my neighbour during our daily “hello’s, how are you’s ” or my friends over the phone? That’s what I eventually did..
..and I was not the only one who liked the idea. 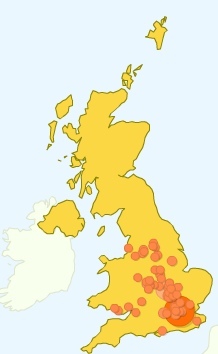 what do I get out of this..
a nice little story of how I got one of my domain names on the mighty bbc and..
..this is my civic action to the people affected..
Here’s where the visitors to boilcheck.com/co.uk came from..
ps: thanks for your help Paul. pps: if you meet Paul in one of the Northampton pubs, make sure you buy him a well deserved pint! Why you have to be quick in the domain race! Big Brother 9 is on air in the UK! And this year again we have been given a varied bunch of characters. From the nasty ones to the hirarious ones and the cool ones, there is one for everybody’s taste. Big Brother’s audience is quite good.. at least similar to last year’s so far. There’s one particular candidate that’s interesting to follow since she is a unique character! She’s from Thailand and to quote Davina McCall, is a “bundle of Joy!”. What is interesting, at least from a domainer’s point of view, is that she’s been inventing new catchy words. Having a slight ploblem with ‘l’s. (Bless her!) She cannot say Hilarious. That’s how she says it! Would you be surprised if I told you that Hirarious.co.uk has been snapped? I wonder how many t-shirts these guys have sold through this! The Chris Moyle’s Show (which has 7.31 million listeners as of 31st Jan 08 ) has been using her shouting ‘Hiraaaarious!’ as a doggerel on radio. and, well… see for yourself what CookiePower.co.uk brings you. These 2 domain names meant nothing a week ago! But with 3 million viewers tuned in to watch Big Brother, and having Kathreya (that’s her name) repeating these words over and over again, they became bound to attract visitors, and domainers saw the potential in them. Oh, and according to the bookies, Kathreya is the current favourite to win Big Brother, so we should expect to hear more of these words for weeks to come, and who knows, maybe new ones.. I want you to give it a long thought and try to come up with a few guesses, before reading further. We’ve been playing this game for quite some time now and it is strange how our minds develop with practice. I tend to look at all the tiny details quickly as they appear on the screen and make associations fast in my mind. We’ve become quite good at this game, I must say! Today I saw a new ad for the first time on tv. The ad is creative! Chefs cutting bubbles, and I was racking my brains to find out which ad it was. until i saw a number 1664.
boom, Kronenbourg sprang to my mind!…. and Kronenbourg it was. I quite like Kronenbourg Blanc and I remember the distinctive 1664 on its bottle. and of course,.. I guess I am not the only one..
try 1664.com on your address bar. HitWiser came to life with a purpose. are all easily reachable by directly navigating to their web addresses. Type in any word, product or service in your address bar,add a .com to it and you will reach a website. if you look at the fastest US search terms on SEARCH ENGINES (click here!) for 2007, and then try them in your address bar (adding a .com),you get the same result. and contribute to creating a Google-opoly? Google is great! nobody can deny it,certainly not me! and hopefully we will not make that happen. the free exchange of ideas. Look at it today! Search engines is very aggressive. type CAR in google and see how many results it returns. the first 10. So, what about the 1,249,999,990 other results? Every Web browser is equipped with a search facility. Our good old address bar. Okay.. yes, I agree, it is not very user friendly. It is located, too far, high up for our eyes to reach. You have to stick all the words together which makes long URLs a pain! ‘pen island’, where they sell great pens?, you would have to type in penisland.com ! the “www.” part of a web address is obsolete. the TLD, hmm. well, “.com” is king, and you can still choose the others! or “the world’s best shave”. HitWiser loves them. They are more descriptive and more exciting. are you going to Hit <your urls> wiser?